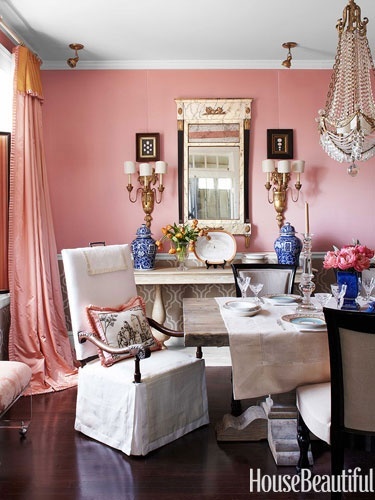 Pink, blue and Chinoiserie perfection. I love the colour combo in this room. This room is absolutely exquisite!!! That's a good one! Love the details in the curtains especially! I felt my blood pressure go down several points just looking at this room. What a pleasant, soothing feeling this has. I'm quite sure that if I lived in this room, my scale would never show a weight gain, my hair would never sprout unexplained grey hairs, and my laundry would be forever caught up! to die for. seriously gorgeous!